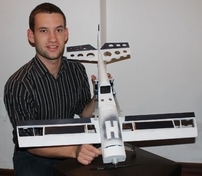 A Second year Mechanical Engineering student from the ’s Potchefstroom Campus, Dolf Jansen van Rensburg recently won the National Research Fund’s student competition with his hydrogen fuel cell powered remote controlled aeroplane. The competition was driven by the Potchefstroom Science Centre at North-West University’s Potchefstroom Campus, the South African Agency for Science and Technology Advancement (SAASTA) and Dr Dmitri Bessarabov of the Department of Chemistry, who has been contracted by the NRF to research various aspects of hydrogen fuel cells the NRF to run a competition aimed at creating awareness of the significance of hydrogen fuel cells. Jansen van Rensburg got involved in the project because it involves two of his great passions; green energy and remote controlled airplanes. “I had a frustration with my remote controlled aircrafts running out of battery power or fuel, and decided to design a craft that will make it possible to create new fuel inflight and immediately refuel if you land just by using water and solar power” said Jansen van Rensburg. This is done by creating a fuel cell system that can obtain water from rain and water vapour in the air, as well as obtain electricity from the sun, wind or wave power. He believes that it is possible to create a self-maintained Hydrogen factory that runs 24/7. This Hydrogen can then be used at any specific time from fuelling for your car to making your morning coffee. According Daphney Molewa, SAASTA spokesperson 19 entries were received where of five finalists were chosen. The contestants were challenged to plan and design a system that would bring awareness of the important role played by hydrogen fuel cells in meeting the growing demand for clean energy. Dolf did a comprehensive study of hydrogen and fuel cells, including production storage and uses, to produce a radio-controlled aeroplane. “I am so pleased to be receiving this award. With the world suffering the impacts of global warming and running out of fossil fuel, aggravated by the ever growing population, South Africa has the potential to evolve as a world leader producing its own fuel for cars, aeroplanes and homes,” Dolf said. His model aeroplane was displayed at the university’s science centre, where more than 10 000 visitors had the opportunity to interact with real small-scale fuel cell devices and with a 5 kW electricity generating hydrogen fuel cell donated by SAASTA, which illustrates how a fuel cell can electrolyse water and recombine it to produce electricity and water.